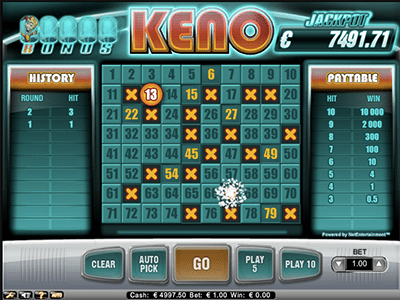 Keno is one of the most casual casino games which offers easy to understand gameplay and the chance to win substantial payouts. We take a look at the five best online keno titles available for Australian players. 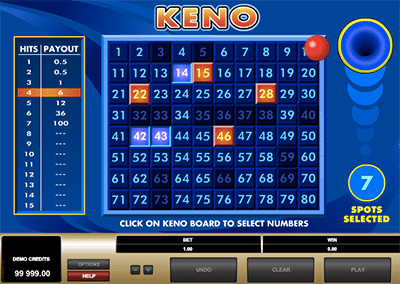 There’s a handful of real money keno games available online which offer better odds than their land-based versions – such as the keno you find at your local pub or club. Live keno is rarely available at land-based casinos, via the traditional way where a dealer draws a ball from the keno machine, so the fact we can get a live dealer keno title and play it from the comfort of our home is very impressive. The live dealer specialist, Ezugi, are behind the the live dealer keno game and you can find it at GdayCasino.com. Players can enter the tables and a HD video feed will load, streaming the dealer who will draw the games in real time. There’s a betting layout where players can select their spots, and the games will take place every three minutes. Players need to place their wagers before the timer ends, or wait until the next round, with up to eight spots available to pick from 80. The best Random Number Generator (RNG) keno game online has to be the traditional title from Microgaming. 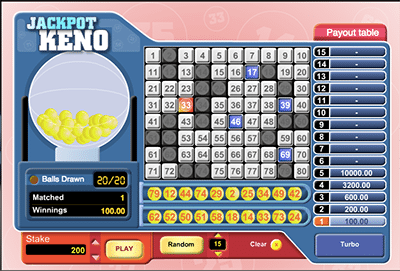 It offers standard gameplay – up to 15 numbers can be picked from 80 with 20 drawn. The payouts change in accordance to the number of spots picked, and you can view this in the paytable situated left to the game screen. The minimum bet is $1, while the maximum bet is $10 per game and the house edge is around 94% for this title, provided you pick more than one number, which is incredibly good for a keno title. Next on our list is Bonus Keno by Net Entertainment. It offers the next best RTP percentage which is 88.7% – quite a jump from the Microgaming title but still better than land-based keno which offers a RTP percentage of around 80%. The reason for the jump is the addition of the progressive jackpot – a cumulative jackpot which grows every time a player places their real money wagers. There’s up to 10 spots eligible to be picked with the paytable situated to the right of the game screen – the payouts change with the number of spots picked. The minimum bet is set at a minimum of $1, and there is a maximum of $5 per game. Players can win the jackpot by landing five jackpot symbols randomly placed under the numbers throughout the game. They will fill the bar in the top left hand screen as you play and once you have all five you will trigger the jackpot. There’s also the option to play five or 10 games in a row with the same numbers – this speeds up gameplay significantly. 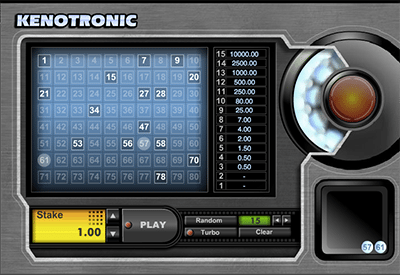 Created by 1X2 Gaming, Kenotronic is great for players after a unique keno title, rather than a traditional one. The electronic soundtrack attached will get you in the mood to win, while the game has been created to tie in with the genre, featuring the game layout on DJ decks. There’s up to 15 spots available to pick with a minimum bet of $0.05, and a maximum bet of $20. There’s also the special ‘Turbo’ option which speeds up gameplay quite incredibly – players who don’t like waiting three minutes between land-based keno games will love this feature. The title does have a RTP of 87.55%, but once again this is better than land-based keno. If you want a higher maximum bet on your keno title opt for Jackpot Keno by 1×2 Gaming, with a maximum of $200 per game, and a minimum of $0.10. Players can pick up to 15 numbers from 80 spots and there’s an added feature where the game will auto-select your numbers at random too. There’s no progressive jackpot attached, despite the name, but we feel it is more of a reference to the high maximum bet on offer. The payouts are to the right of the side, but picking 10 to 15 numbers yields the same payout so keep this in mind. The RTP for this title is 87.55% too. These are the best keno games on the web, so follow our links to the online casinos listed and register an account to get playing. We only play keno at secure online casinos which offer fair games – confirmed by the third party licensing accreditation from respected regulatory bodies. You can find the top five keno games at these online casinos, too.